Particularly recommended to players in Japan (website also available in Japanese). 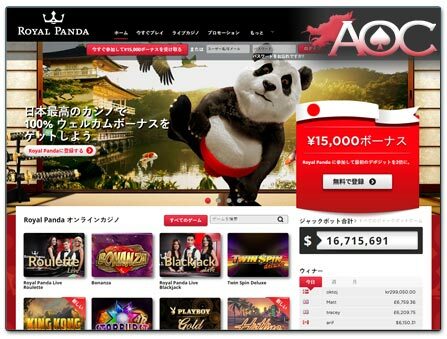 Royal Panda is a great choice for Japanese gamblers, as this online casino offers a wide variety of games, including live dealers and mobile games, as well as an attractive deposit bonus with fair wagering requirements – see details under the ‘Bonus’ tab. In addition, it is one of the few casinos that enables players in Japan to do their banking in Yen, eliminating any currency conversion or exchange fees. In other words, you can credit your account, play and ultimately cash out your winnings using Yen at Royal Panda, while at many other online casinos the US dollar is used as the base currency. In operation since 2013, Royal Panda has already established a reputation for excellence and for being a great place to play, which is also due to the impeccable customer support and fast cashouts. Last but not least the casino is licensed by both the well-renowned gambling regulators of Malta and the UK to operate an online gaming establishment. That said you can rest assured that playing your favourite casino games at Royal Panda is not only fun, but also safe and secure. Recommended to both Japanese players and Chinese speakers (the website is available in both respective languages as well as in English). The complete website is available in Japanese (that includes many of the games). Deposit to your account and cash out winnings using Japanese Yen. Great selection of games from various popular software providers. European-centric live dealer games from market leaders Evolution Gaming. 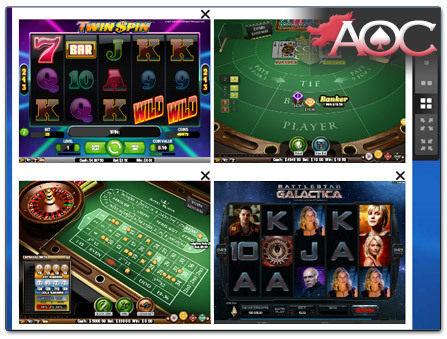 The casino games are also available on smartphones and tablets. Royal Panda offers a number of different promotions. Their first deposit bonus is a 100% match up to ¥15,000, with a 35 times roll over. Bonus money wagers in slots count for 100% and table games and video poker count for 10%. They also have a weekly Bamboo Bonus where you can get a 50% match up to ¥22,500 and a monthly blackjack promotion where you can win a draw for ¥31,500. Royal Panda also has a loyalty programme which is termed Loyal Panda. With this program you earn points any time you play real money games, and these points can be redeemed in their shop. You can use these points to purchase bonus funds and free spins, as well as electronics like a Macbook or an iPhone. You can also get neat Royal Panda merchandise like a Royal Panda hat or Royal Panda playing cards. Note that casino game wagers placed using bonus money are subject to a maximum bet per game round limit (this rule applies in many casinos when a bonus is active). The maximum bet permitted when playing with bonus money is $7.50 or its equivalent in another currency (approximately ¥780). 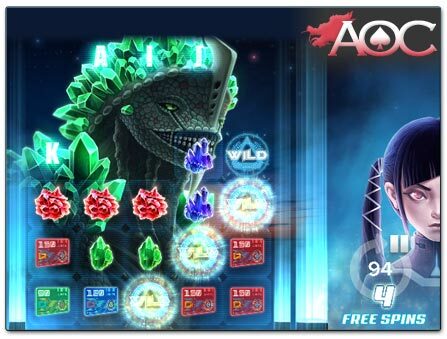 In the case of the following slot games, these operate with a deviating maximum bet of $1.50 (approximately ¥150), when playing with bonus money: 300 Shields, 1429 Uncharted Seas, Blood Suckers, Dead or Alive, Kings of Chicago, Hellboy, The Rift. Of course, when playing with your own money this rule does not apply. For detailed information on how casino bonuses work please refer to our section Understanding Wagering Requirements. Customers of Royal Panda can play a lot of different games, including many online slots, or both live dealer and virtual table games (most games also available in Japanese). You will find slots from a number of popular software providers, such as the powerhouses NetEnt, Microgaming and NextGen in addition to Thunderkick as well as Leander Games. Included are many classics such as Gonzo’s Quest and Koi Princess, but also recent additions to the slot portfolio, for example Kaiju by developer ELK Studios (see image below). To top it off, Royal Panda features a great selection of jackpot slots including titles such as Mega Moolah and Divine Fortune. A good online casino can stand out from the competition by offering various extras and features, making the visit more interesting for players and thus providing the best reasons to return. For one, you have the option to play most Royal Panda games on your mobile and tablet. Of course, this is also true for many other gaming portals, but then there is the fact that not every casino can offer players the opportunity to bet on up to four games at once (see below). Furthermore, Royal Panda developed a section on its website that lists hot and cold slots – in other words, this feature gives you a little more information on the volatility of some games. By choosing the option hot (recently paying) or cold (not recently paying), and selecting an amount you want to bet and choosing a timeframe, you will get a list of slots that either tend to pay quick wins (hot slots) or are due for a big payout (cold slots). One of Royal Panda’s most popular offerings is live dealer baccarat, brought to you by their partnership with live dealer powerhouse Evolution Gaming. Evolution offers Baccarat Squeeze, a live dealer version of this game meant to replicate as best as possible the experience of casino baccarat where the dealer squeezes the third cards received by both the player and the banker. Knowing only what side the next card is going to be heightens the suspense and anticipation of the user’s playing experience. In addition to the traditional baccarat bets of player, banker, and tie, you can also find additional sidebets in the Royal Panda live dealer baccarat games, such as betting on the player or the banker to get a pair or a perfect pair (two cards of the exact same rank or suit). These sidebets can really spice things up and have some huge payouts. There is also a player and banker bonus option, where you can bet on either side to win by at least four points, and the more points your side wins by, the higher it pays. Royal Panda’s games are mobile friendly, and their mobile optimized website works with both Android and iOS. The best part is, there is no download required. Simply load up Royal Panda Casino on your mobile device and they will take you to their optimized website, with over six hundred different games to choose from. Just log in with your regular account details and you will be good to go. Royal Panda is oriented towards Japanese customers and has taken steps to make their site more accessible. As a result the Yen is a supported currency, so you won’t be subject to foreign exchange fees when depositing or cashing out. Additionally they support the popular e-Wallets Venus Point, ecoPayz and iWallet, though players in Japan can also use conventional credit cards to credit their real money account (including AstropayCard). There are no fees when depositing, and withdrawals are processed in a timely fashion (also free). If ever you require to get in touch with the customer support of Royal Panda, it is good to know that they also offer their services in Japanese. Availability: Every day between 09:00 and 00:30 (CET). Below you can see a list of payment methods relevant to Japanese players (alphabetically ordered). In addition, various other options are available, which comes down to the currency and country. Smartphone users: To completely view the table below please scroll sideways. Q: What Asian countries does Royal Panda serve? A: Royal Panda takes customers from many countries around the world, including Japan and China. The website is also available in both Japanese and Chinese. Q: Is the Yen a supported base currency at Royal Panda Casino? A: Yes, you can deposit, play, and cash out without having to convert funds and suffer from foreign exchange fees. The casino accepts a variety of popular payment methods like ecoPayz, Venus Point and iWallet that also guarantee fast withdrawals. Q: Can I play on Royal Panda for free? A: Yes, the majority of games on Royal Panda can be played just for fun. In order to do so, you don’t have to register an account nor be logged in. The live dealer games are an exception, as these can only be played with real money. A: Yes. Simply visit the Royal Panda website, www.royalpanda.com/ja/ on your smartphone or tablet and you will be redirected towards their mobile optimized site, where you can play over six hundred of your favourite games (easily including more than 550 slots). Q: What is the best baccarat game at Royal Panda? A: We recommend the live dealer Baccarat Squeeze game, which replicates the actual casino experience as much as possible. The dealer squeezing the cards really adds to the suspense, and in addition to the main bets there are a number of very interesting sidebets you can go for with really high payouts. These online casinos also offer their services in Chinese. These online casinos are popular with players in Japan. Copyright © 2005 - 2019 AsiaOnlineCasinos.com. | All Rights Reserved.